Extend the life of your Rv rubber roof! 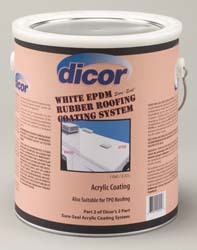 Two-part, commercial grade system combines a primer/cleaner necessary for proper roof preparation with an acrylic coating to provide an excellent protective barrier for extending the life of the EPDM rubber membrane. This two-part system (primer/cleaner & acrylic coating) saves over 25% in labor compared to similar systems. Quick drying time. Endorsed by Carlisle Syntec Systems.---Excellent protective barrier extends the life of your rubber roof membrane. High solids acrylic elastomer coating system provides superior weatherability, UV resistance, fire retardation, elongation, flexibility, adhesion, and ease of application. Use with Rv Rubber Roof Primer/Cleaner for proper adhesion. Requires two coats for adequate protection.